The 3DS's recent price cut was surprising. The handheld is still new, and a drastic slash like that whiffs of desperation. But don't worry, the 3DS isn't dead, by any stretch. Maybe one of Japan's most successful manga artists can work his magic. 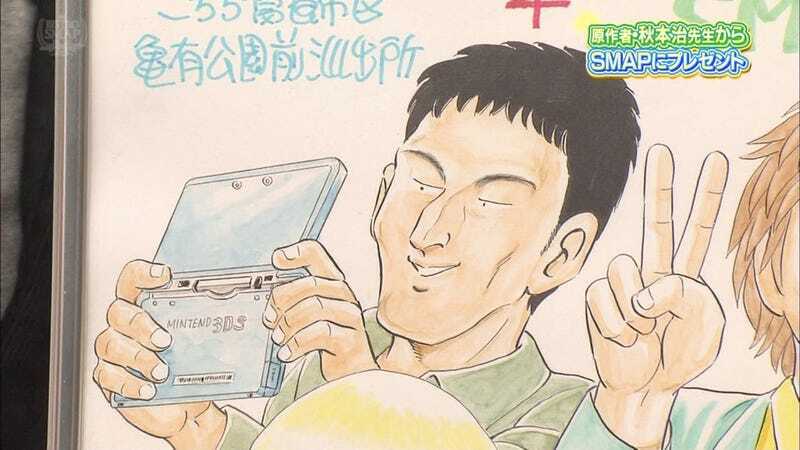 While appearing on variety show SMAPxSMAP, famed manga artist Osamu Akimoto drew a picture of boy band Smap, penciling a "Mentendo" 3DS in the hands of Smap member Tsuyoshi Kusanagi. Akimoto drew items that relate to each member's likes or hobbies. For example, member Masahiro Nagai, a huge baseball fan, is holding a bat. Akimoto's most famous creation is Kochikame, a police comedy manga that has been continuously serialized since 1976, making it Japan's longest running manga series! So if anyone knows about staying power, it's Akimoto. Maybe some of his longevity will rub off on the Mentendo, I mean Nintendo, 3DS.